A report on Alaska’s oil potential is at the heart of a controversy at the Department of Interior. The magazine Mother Jones reports that a top scientist at the U.S. Geological Survey resigned late last year to protest what he saw as a threat to the agency’s scientific integrity just before USGS released a major assessment of how much oil and gas it believes is in the National Petroleum Reserve-Alaska. 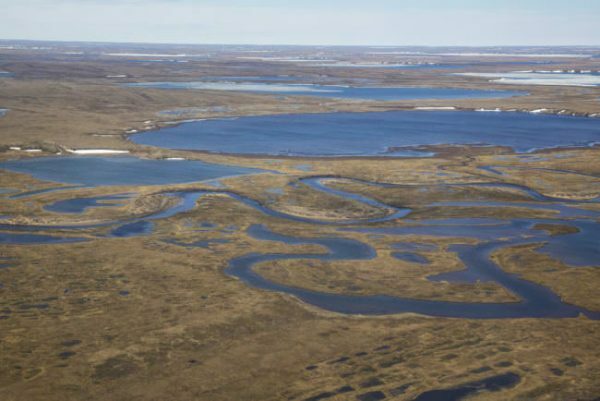 The assessment looked at the oil potential of the Petroleum Reserve, or NPR-A, a massive chunk of land on Alaska’s North Slope, west of Prudhoe Bay. Interior Sec. Ryan Zinke announced it just before Christmas in a press release with the headline: “New Interior Department Survey Shows ​HUGE Increase in Recoverable Energy Resources.” “HUGE” was in all caps. The USGS is a research arm within the Interior Department, and that breathless announcement was definitely not USGS style. Geologist David Houseknecht was the prime author of the report on the NPR-A. “When it comes to doing the quantitative assessments we take every precaution to avoid even the hint of political bias or influence,” Houseknecht said. Mother Jones reports USGS Associate Director Murray Hitzman resigned on principle after the No. 2 boss at Interior, Deputy Secretary David Bernhardt, pressed the USGS to release the oil and gas data to the secretary days before it was released to the public. Hitzman, who was the associate USGS director for energy, did not respond to interview requests for this story, but Mother Jones published his resignation letter. The oil industry and the Trump Administration have their eyes on the Petroleum Reserve as a big opportunity for future development – including areas the Obama administration had put off-limits. For years, Houseknecht said, the USGS has made it a practice not to brief political appointees on finished assessments until the moment the document is released publicly. That way neither side, pro-drilling or anti-, gets a head start in putting its spin on the data. “The credibility of the USGS. That’s the most important thing to us,” Houseknecht said. But, Houseknecht said just about every administration in his 25 years with the service, has tried to get an early peek at the numbers. Houseknecht said as far as he knows, the USGS was not ultimately forced to provide a preview of the data, but then he wasn’t at every meeting. David Hayes was deputy Interior secretary in the Obama administration. He said the USGS’s concern is understandable, given the sensitive context of the Petroleum Reserve report. “Because Sec. Zinke has made it very clear that his intent is to reopen the (NPR-A) management plan that was finalized during my tenure at the Interior Department, which identified area not appropriate for oil and gas development,” Hayes said. A spokeswoman for Interior Sec. Zinke said Zinke and his deputy have the legal authority to see any scientific data produced by the Department. She also sent a statement from the acting USGS director saying the service was not asked to change the assessment at all. Still, the episode has riled conservationists. Adam Kolton, director of the Alaska Wilderness League, said it doesn’t bode well for the environmental studies that have to be done before any developments in NPR-A or to the east, in the Arctic National Wildlife Refuge. Houseknecht said scientists like him weren’t thrilled to see the Interior Department use that all-caps “HUGE” in its announcement of the NPR-A assessment. But he said nothing in the report was changed to suit anyone’s political agenda.